I know you're thinking the title of this blog post is an oxymoron, and I kind-of agree with you. HOW can a crafter be a minimalist right? Well, OUR minimalism might not look like the rest of the Pinterest minimalist world, but it CAN be done! ANYWAY, to make a long story just a little shorter, I think I'm on to something with this "minimalist crafting" idea. And you know what conveniently fits into my idea of minimalism? Paper Pumpkin of course!!! Have you signed up yet??? If you're not convinced yet, just keep coming back and you soon will be! Tomorrow I will publish the first video in an ongoing monthly series of how to get the most for your money by helping you get more use out of those must have items from the Stampin' Up! 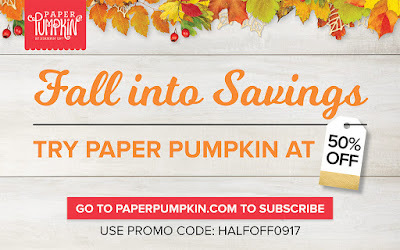 catalog AND that amazing all-inclusive monthly craft kit in a box... Paper Pumpkin! Labels: Craft Room, Paper Pumpkin, Red Hot Stampers, Sale, Stampin' Up!